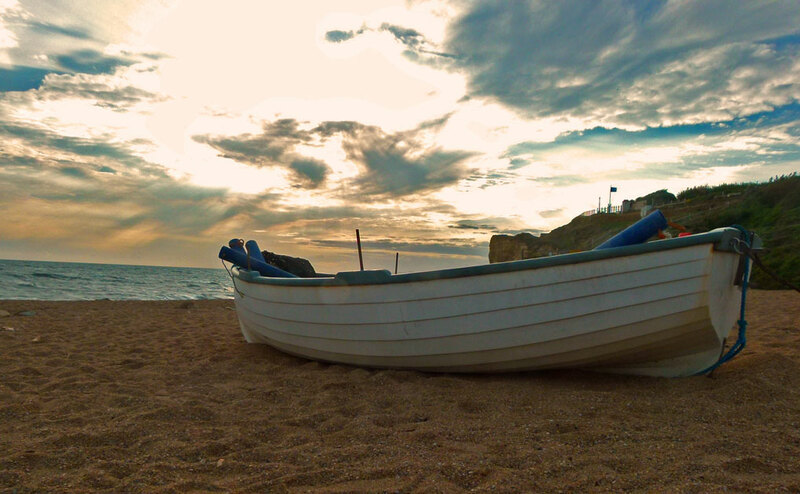 Burton Bradstock was on the List of Places to See in Dorset. 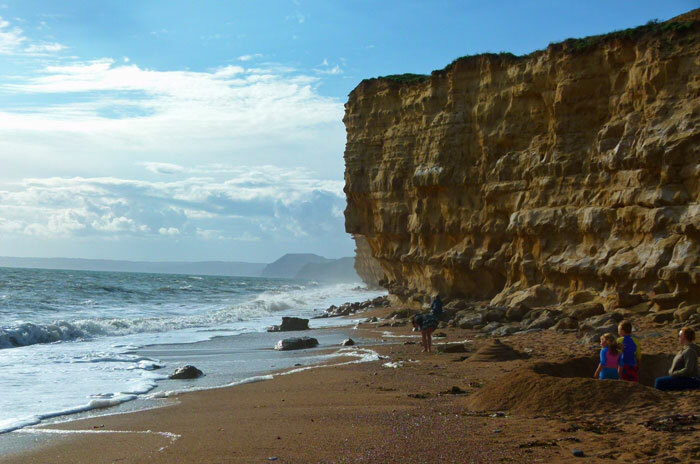 The National Trust guidebook tempted us to visit the beach which, as you may have gathered, is not called Burton Bradstock at all. 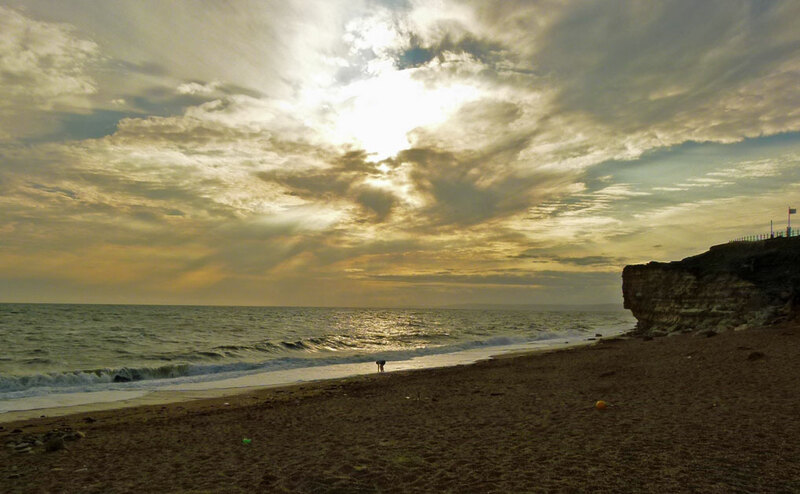 Burton Bradstock is a ridiculously pretty looking village and the beach, Hive Beach, is a little farther on. Unfortunately, it was one of those days when we tried to cram too much in; with the tide in, darkness falling and a long drive ahead, we spent far too little time on the beach and no time at all in the village. 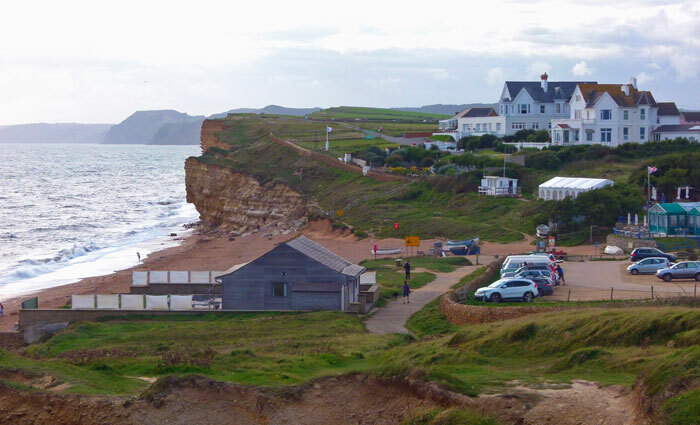 Which was a pity, because not only did the pubs look very tempting but Burton Bradstock is also home to activist-musician and Bard of Barking, Billy Bragg. Say what you like, but ‘New England’ is a terrific song – particularly the version by the late, great, Kirsty MacColl. The beach and nearby cliffs were beautiful. As the sun went down, we clambered onto the higher ground in search of alleged views of Chesil Beach, some distance to the east. We passed a typically unattractive caravan park, and 53 dog-walkers, then turned back, time pressing. It’s a spot we need to return to – when the tide is out. I’ve yet to find a stretch of the southern England’s Jurassic Coast that doesn’t appeal. Gorgeous scenery, good coastal walks, nice beaches, opportunities for fossil-hunting, tales of smugglers and quaint villages – though some of the towns can be a bit tacky. But Hive Beach has its own USPs. For starters (and possibly a main course too), the buzzy Hive Beach Café, where we stopped for a mere plebeian coffee, looks like a place to be; a trendy beachside eatery with aspirations. Perched above the seashore with a kind of temporary feeling about its construction, the menu nevertheless looks appealing, the crowds were starting to drift in as we drifted out and I gather it has won awards. 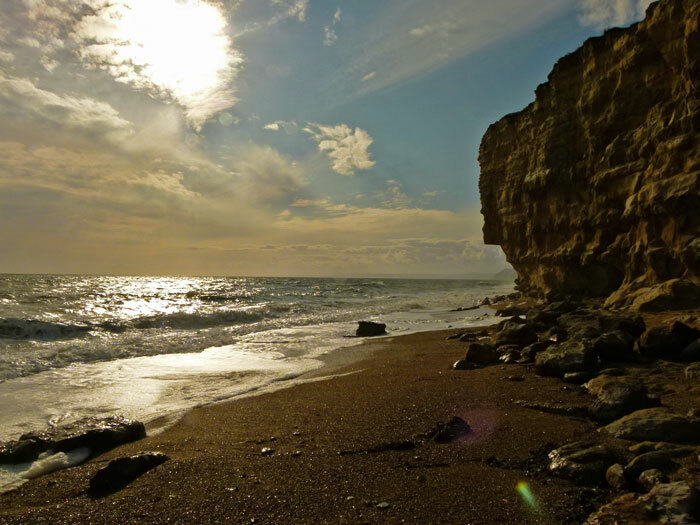 Slightly more interesting, though less nourishing, Hive Beach and its nearby cliffs were used by both British Commandos and US Rangers for training purposes during World War Two. The coast hereabouts has similarities to parts of Normandy and there is some fascinating film footage showing American troops scaling the cliffs. So many didn’t make it back. This story featured in the BBC’s first-rate TV series Coast – checkout the YouTube clip below. Just east from Hive Beach, near West Bexington, the remains of a B-17 Flying Fortress lie on the seabed a little off-shore. Better known as ‘the Abbotsbury Bomber’, I haven’t been able to track down much about it, except that the aircraft apparently crash-landed after a raid and the crew survived. One final essential piece of information before you visit Hive Beach is that spider crabs conglomerate in huge numbers for mating just off the shore – I imagine a kind of Saturday Night at the Palais for crustaceans. I’ll leave you with a bit of Kirsty MacColl singing Billy Bragg’s ‘New England’ and a final view of the beach. Go to A Bit About Britain’s directory and discover other places to visit in Britain. Those layered cliffs are absolutely gorgeous. Thanks for including the video clip as well- what an interesting bit of history! What beautiful views at the beach! Coast is a series that has made it over here, but I don’t recall seeing that segment before.